Borrowed from Google. Edited by me. In keeping with tradition here on Confetti Letters I want this giveaway to be interactive and let you choose something you'd like to win. Part 1 of the prize is a £10 gift card to a shop of your choice. I hope that you'll be able to buy something(s) exciting with it, or put it forward as part payment for something that you've got your eye on. Part 2 of the prize is a small selection of my favourite makeup products, including Maybelline The Rocket Mascara, a Revlon Lip Butter (in a colour of your choice) and a Maybelline colour Tattoo (in a colour of your choice). All you have to do to win is follow the rules below and fill in the Rafflecopter form. I know that of late there has been some difference of opinions regarding giveaways and having rules and blah, blah, blah. But this is my little nook of the interweb, and I shall run my competition how I would like. If you don't like, don't enter - simples! I am not being sponsored/compensated or anything like that for this giveaway. The prizes have/will be bought with my own money. The giveaway is open UK readers only I'm afraid (sorry if you're an international reader). The winning decision is final, if the first winner does not respond to my e-mail within 48 hours of them being notified as the winner another will be chosen. In order to enter you must complete the Rafflecopter form below. Lovely giveaway Louise & congrats on all your followers! Hi gorgeous, this is so lovely of you! I would love a feelunique gift voucher as I've been eyeing up the TIGI S-Factor Health Factor Shampoo & Conditioner Duo for some time now!! Such a lovely giveaway! I would choose John Lewis so I could put it towards trying Bobbi Browns undereye corrector, I'm dying to try it! WOW! This giveaway looks amazing, very generous! Thank you for the giveaway! I would have a debenhams/selfridges gift card to put towards an origins face mask! Well done on reaching all those milestones!! I'd love a Boots or Debenhams gift card so that I could hit up the Benefit counter- probably for some of their 'total moisture' moisturiser- it's heavenly! I think either Topshop or Boots, as I'm always lusting over beauty products or something from Topshop! Congratulations Louise, you deserve everyone of your followers! I'd like one for Boots or Debenhams and I'd put it towards Brow Zings by Benefit! Definitely boots to put towards a make up haul! I want the gift card to be for boots or amazon! So I can put it towards some real technique brushes. What an amazing giveaway! Thank you so much for this! Congratulations on all your followers! Thank you for hosting this awesome giveaway too! I think I'd choose maybe a Boots giftcard, as you can never have too much makeup! Congrats Louise! :) This is such a great giveaway. I would choose Space NK so I can use it towards Laura Mercier foundation or the NARS palette I've been lusting after! I'd like a voucher for Evans, to put towards a new post-baby dress! Mine would be towards Superdrug, I'm not sure if they even do a gift card if they don't one of the love 2 shop vouchers so I can get make-up or a new dress. My voucher would be towards something like Debenham's or House of Fraser so that I can justify some of the more expensive makeup item that are on my wishlist! Probably Debenhams, and I'd either put it towards, something from MAC, Benefit or an Ubarn Decay Palette! Would say Boots to put it towards buying items for my holiday. I'd love it for Boots. I'd maybe put it towards a Soap & Glory product or BB cream! I would love a gift card for Boots to put towards a new Benefit product because I love them at the moment but they're a bit pricey. Congratulations! It must be so exiting reaching so many followers and doing a giveaway, I cant wait to do one. Ooh I think I would love to have a giftcard for boots so I can buy something nice just for me! Aww well done, That's great news. Great giveaway as well ! Congrats on your milestones, and thanks for the lovely giveaway! I'd love a gift card for Topshop to go towards my summer holiday bikini! OOOhh it's a tough one. I think I'd say ASOS as I can always find something I like on there. Failing that... Mac for a gorgeous lipstick!! 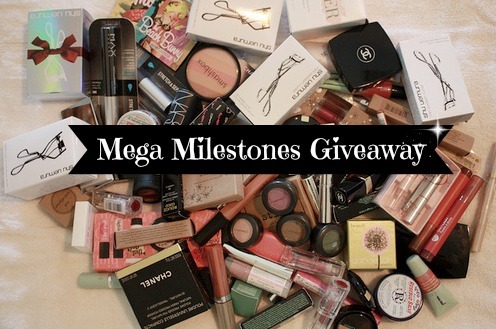 Amazing giveaway :) Would love the MAC giftcard! I would love to have a boots card or Debenhams card. If I get Boots card then i will buy Soap & glory products. If I get Debenhams card then i will use this on any MAC product. This is such an amazing giveaway! The prizes are so so lovely! Congratulations lovely! Such an amazing giveaway! I would love a Topshop gift card so much I like in there. I'd love either a House of Fraser gift card or debenhams and I'd use it to buy either Nails Inc polishes or Urban Decay stuff!